National Night Out is an annual event promoting police-community partnerships and neighborhood camaraderie to make our neighborhoods safer, more caring places to live. Communities across the United States host block parties, festivals, parades, cookouts, and other fun activities. In Texas, we celebrate NNO on the first Tuesday in October. Are you planning or attending an event in your area? 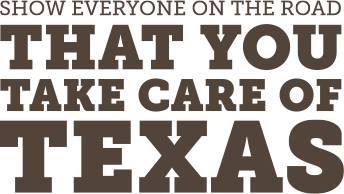 We provide free materials for kids and adults that you can hand out at your event to help your neighbors learn how to Take Care of Texas. Many of our materials are also available in Spanish. Order today!